Articulate Quizmaker lets you customize preferences for spelling and other system options. In this tutorial, we'll show you how to access and change these options. First, you'll need to open the Quizmaker Options window. Click the round Articulate button in the upper-left corner of the Quizmaker window, and choose Quizmaker Options. 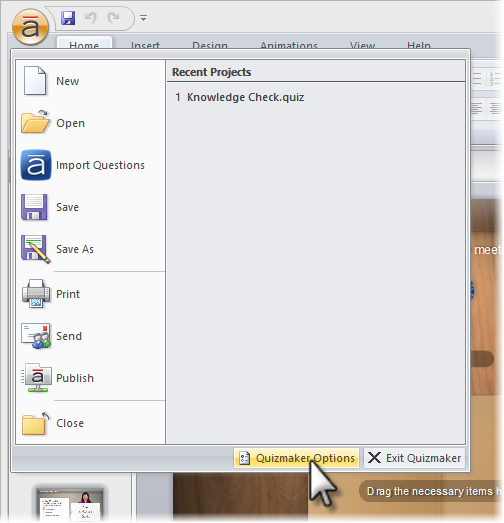 The Quizmaker Options window appears, where you can adjust the following options. Check for updates at startup: If you leave this box checked and are connected to the Internet when you launch Quizmaker, the program will automatically check to see if updates are available. Enable publishing for manual upload to Articulate Online: If you use Articulate Online, you'd normally publish and upload your content at the same time. But if you'd like the option to publish locally first and then manually upload your content later, mark this box. For details on manually uploading content to Articulate Online, view this tutorial. 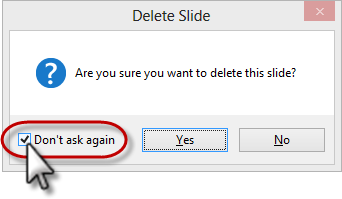 Reset "Don't show again prompts": For some actions, such as deleting slides, Quizmaker displays a confirmation prompt along with a box that says "Don't show again" or "Don't ask again." If you mark that box, Quizmaker will no longer display the confirmation prompt when you perform that action. To reset your preferences so that Quizmaker once again displays all confirmations, click Reset "Don't show again prompts." 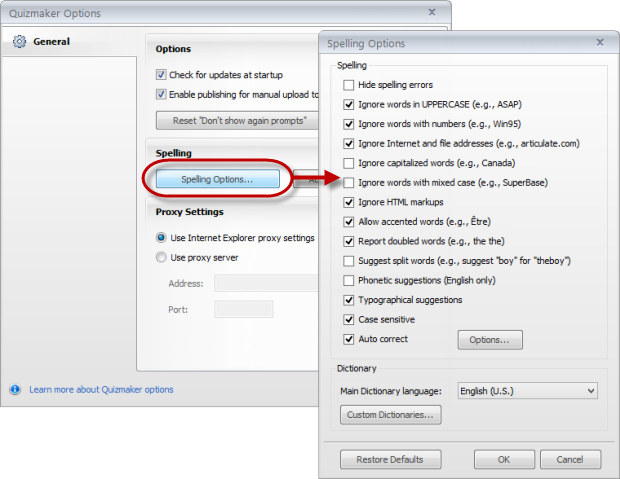 On the Quizmaker Options window, click Spelling Options to set your preferences for the spell checker and dictionary. Keep in mind that preferences you set here will also impact other Articulate products that are installed on the same computer. 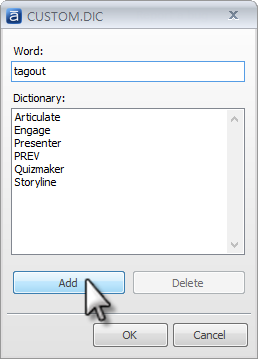 (If you have Articulate Presenter installed, the spelling options in Quizmaker will not affect it, since Presenter uses the spelling options in Microsoft Office). Hide spelling errors: Hides the wavy red lines that normally appear under misspelled words while you're editing your slides. (But if you run a spell check, the misspelled words will still be caught.) If you choose to leave the wavy red lines visible, you can right-click any misspelled word for a list of suggested spellings. Suggest split words: If a misspelled word appears to be two separate words, Quizmaker might suggest an appropriate correction during spell check. Phonetic suggestions: During spell check, if a misspelled word resembles the phonetic spelling of an actual word, Quizmaker will provide suggested corrections. Case sensitive: Enables Quizmaker to distinguish words based on the case patterns of their letters. Auto-correct: Enables Quizmaker to dynamically correct misspellings as you type. If you mark this box, you can also click the auto-correct Options button to customize the auto-correct dictionary. See the "Auto-Correct Options" section of this tutorial for more details. 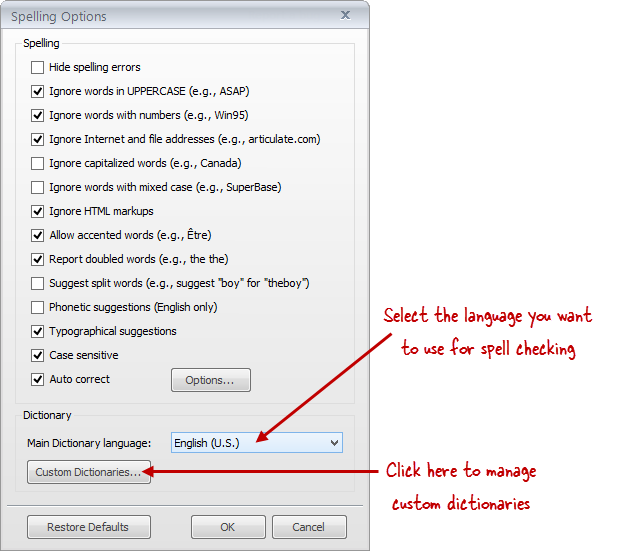 From the Spelling Options window shown above, you can use the Dictionary settings to switch Quizmaker's spell checker to a different language, or to manage your custom dictionaries. Use the Main Dictionary language selector to choose the dictionary you want to use for spell checking. Click Custom Dictionaries to add, modify, or remove a custom dictionary. A custom dictionary is a way to supplement your main dictionary with additional words that you don't need Quizmaker to flag during spell checking, such as names, industry-specific or technical words, or alternative spellings. Modify a dictionary: Select a dictionary and click Modify. A window appears where you can add or remove words from your custom dictionary. To add a word, type it in the Word field and click Add. To remove a word, select it from the list and click Delete. Click OK when you're done making changes. Change the default dictionary: To use a different custom dictionary by default, choose a dictionary from the list on the Custom Dictionaries window and click Change Default. Create a new dictionary: Click New. 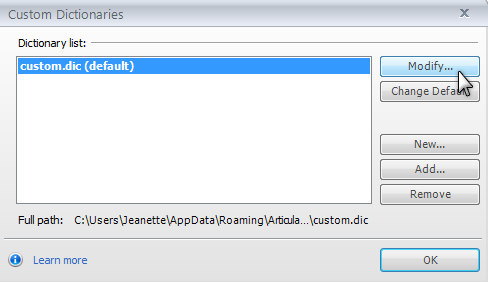 Type a name for your new dictionary in the File name field, then click Save. The new dictionary will now be in your dictionary list, and you can add words to it as needed. Add a dictionary that already exists on your computer: This option is for cases when you've obtained a .dic file from someone else and you have the file on your computer but it doesn't appear in the Dictionary list. Click Add, navigate to the .dic file you'd like to use, and select it. Then click Open. The dictionary will now be in your dictionary list, and you can modify it as needed. Remove a dictionary: Select a dictionary you want to remove. Then click Remove. This doesn't remove the .dic file from your hard drive, but it does remove it from your dictionary list in Quizmaker and other Articulate programs. 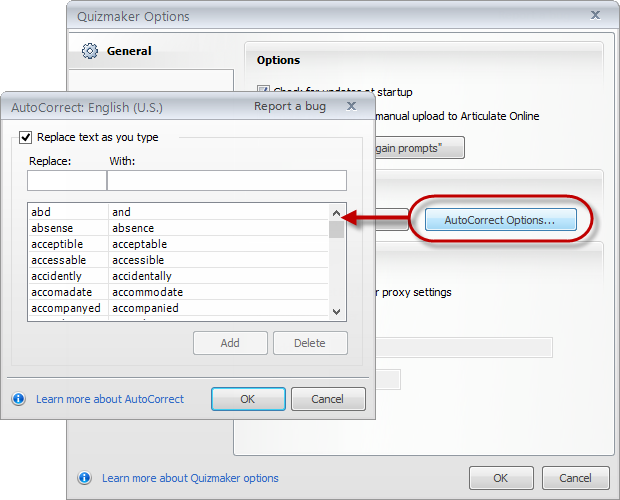 The autocorrect options allow you to set your preferences for the way Quizmaker automatically corrects common misspellings. 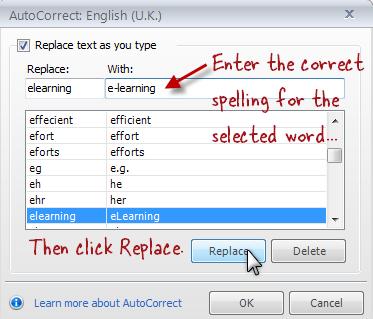 You can reach these options either by clicking the Options button on the Spelling Options window shown earlier in this tutorial, or by clicking AutoCorrect Options on the Quizmaker Options window, as shown below. When the AutoCorrect window appears, you can turn the autocorrect feature on or off by marking or unmarking the Replace text as you type box. To change the text Quizmaker uses for the correction: Select a word in the left-hand column. In the With field, type the text you want Quizmaker to replace it with. Then click Replace. 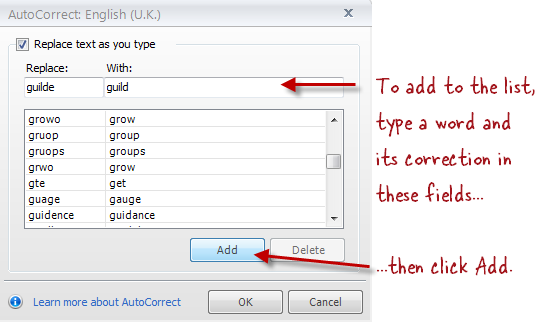 To remove a word from the autocorrect list: Select the word you want to remove and click Delete. To add a word to the autocorrect list: In the Replace field, type the word you want to add. In the With field, type the word you want it replaced with. Then click Add. Click OK when you're done managing your auto-correct list. On the Quizmaker Options window, there's also a section for Proxy Settings. These options are for Articulate Online users who may need to use a proxy server in order to publish their course to an Articulate Online account. In most cases, leaving the default option selected (Use Internet Explorer proxy settings) will work just fine, but if your organization uses a proxy server, you can select Use proxy server and enter the Address and Port. Check with your IT department if you're unsure about whether you need to do this, or if you don't know the address and port information.